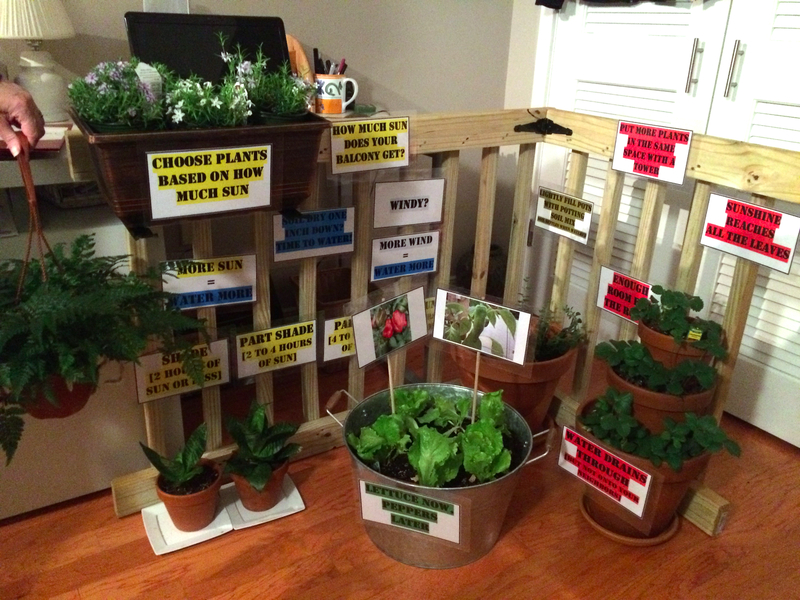 For their intern project, Sandy Burkholder and Marilyn Thomson (Master Gardeners of Northern Virginia, Class of 2016) prepared an extensive exhibit for the 2017 Arlington Homeshow and Garden Expo (AHGE) that included a portable mock balcony demonstrating different container gardening strategies. Sandy and Marilyn supplemented their personal knowledge of balcony gardening with resources from several mid-Atlantic university extension services. They identified existing balcony gardening resources, reformatted them as needed, and combined them to create public information packets to hand out at the AHGE. Marilyn also created a tabletop display and staffed the exhibit. Sandy built the portable mock balcony. The mock balcony, the handouts, and the tabletop display provided information that balcony gardeners need to take into account, such as wind, sun exposure, the amount of weight a balcony can support, and homeowner association rules and regulations. 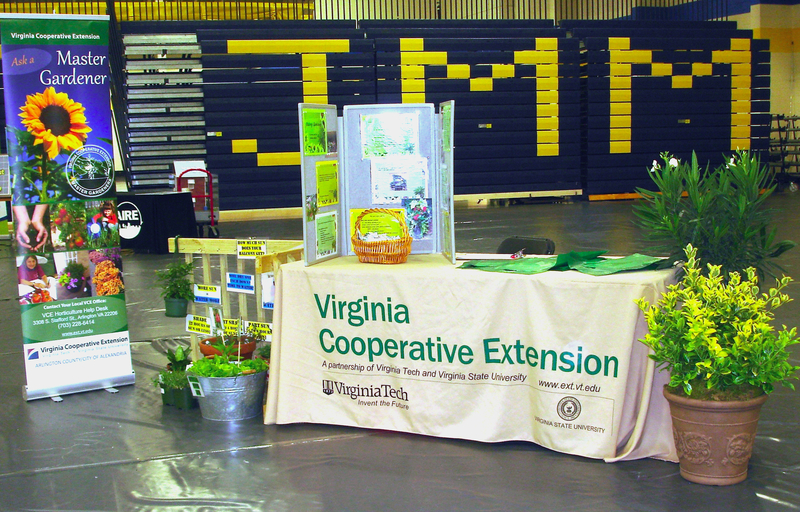 The mock balcony demonstrated hanging baskets, window boxes, a plant tower, and an example of succession planting, using a beverage tub as a planter. Labels indicated the growing condition each container was designed to address. Sandy noted that heat can be a concern for balcony gardeners in Virginia. She recommended using plants that can tolerate a heat zone one higher than the zone in which the balcony garden is located. Additionally, pots on the mock balcony can be raised on small feet to promote air circulation. Marilyn added that balcony gardeners need to remember that, like any container plantings, plants in balcony gardens can dry out quickly and may require extra watering. Sandy also exhibited the mock balcony at the MGNV Organic Vegetable Garden, the Arlington Food Assistance Center’s annual spring garden kickoff and at a balcony open house. She presented the mock balcony at Arlington Central Library’s Wednesday night Garden Talks and at the Container Gardening class. She created the 2017 Balcony Garden Basics handout for participants to take with them. This entry was posted in Balcony/Container Gardening, Intern Projects and tagged balcony gardening, container gardening, dipslays. Bookmark the permalink.